Seated Bather was painted by Pablo Picasso in 1930. The painting has a surreal-esque and very unnerving nature. Picasso's use of colors and contrast in his work display his mood. Study of this painting will show the way he connected cubism with the surrealist movement. 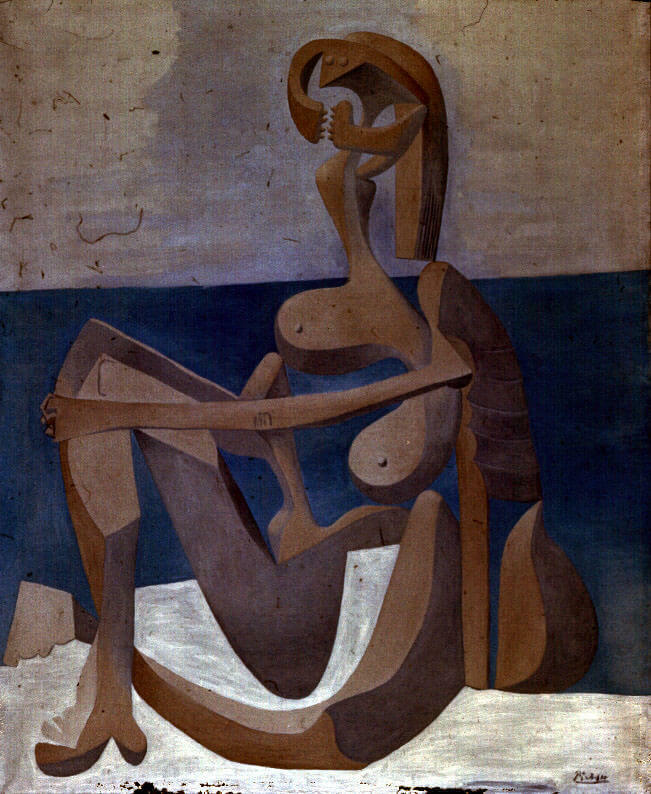 In Seated Bather, the woman's head is sectioned off into pieces, her eyes are merely extensions of the top part of the head, her mouth is sideways and has no jaw connected to the face. The cubism style Picasso used in this painting is closely related to surrealism. The way the woman's body seems to flow like water in this painting is very similar to the clocks in The Persistence of Memory by Salvador Dali. Picasso's mood during the painting of Seated Bather is shown as clues, hidden deep within his artwork. Picasso used natural colors for the woman and the setting. The natural colors of the woman cause the viewer, if only for a second, to feel the painting has a sense of realism. The subtle color and flow of the water show that Picasso most likely was not rushed and felt calm and relaxed. Picasso's sharp contrast of color during the forming of the legs and head he was trying to make a point that this is how it is supposed to look. Contrasting is such a manner can be perceived as his confidence in his art.